1. Hey, is this some kind of Disneyland? The second time I saw the city of Ermoupolis on Syros, I was convinced I had been cast ashore onto some kinder, cleaner iteration of Piraeus, one with Instagram filter set to perma-Disneyland. All those bright colors, the moving smiling people, heck, I even saw a cat stare down a petrified rat by some portside café, but then let it go without so much as a hiss or pounce – everything seems gentler in this sunny and strange Cycladic kingdom. And that is no complaint. I love Piraeus and all its grit but the absence of it in compact Ermoupolis, a town that is a capital and knows it, is pure urban lemonade. Even the industrial contours of the Neorion shipyards, with all those big chunks of metal sticking up by the water’s edge, seem more like a semi-amphibious art installation than working harbor. And Jesus, why does everyone seem so happy, and where do they all disappear to from 3 to 6? But this is Ermoupolis and intrigue comes with the deal: it’s up to you how you manage it. “What is the Greek word for sand?” I asked him. He told me. 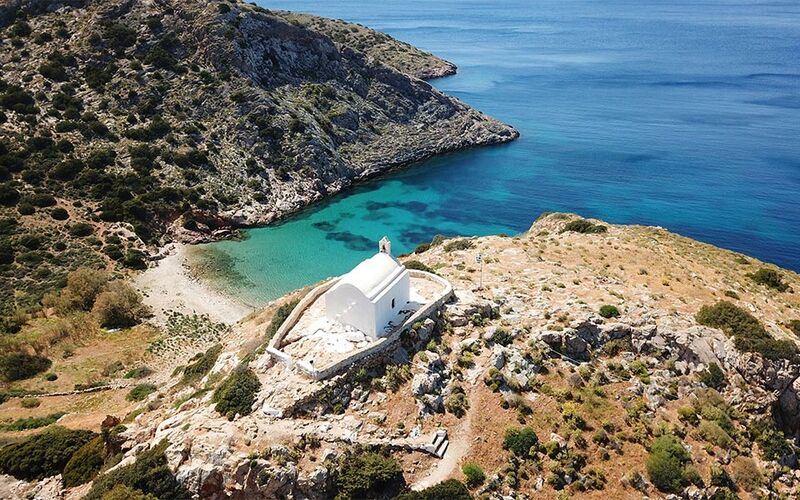 Because in point of fact one of the best beaches you’ll find anywhere is right there in Ermoupolis, a long stone’s throw from the picture-perfect harbor. 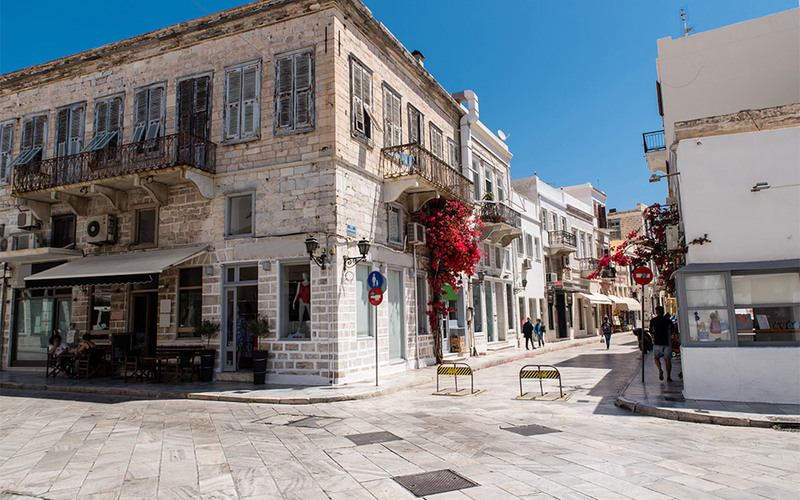 All you do is cross over wide Miaoulis Square and slink like a seahorse through the lanes of Vaporia, with their neoclassical sea captain’s mansions and pastel shaded balconies, find a passageway between the buildings and jump in. There are a number of spots where you can do this, like the hidden seaside terrace of the lovely Hotel Ploes, but you have to be a hotel guest. Then there are some secret places and also some quite social ones, like the famous, non-beach seafront Asteria Beach Bar. There, you can nibble under the sun and then just jump, minding the sea urchins as you take an easy plunge into waters pristine and aquamarine. And once you’re out, no messy sand between your toes! Once, having jumped into the sea next to the Ploes, turning away from the surreal sight of the big blue dome of Agios Nikolaos looming over the water line I swam over to what I was sure was a pleasant seafront bar, part of a hotel perhaps. There was a small ladder extending into the water so I climbed up it. The place had a beautiful and wide terrace. I looked around but couldn’t find anyone to take my order, so I just idled on the terrace for a moment, dripping wet, until finally an elegant lady in a black bathing suit and sunglasses turned up. “This is our house,” she said, as she lowered her sunglasses. The first time I saw Ermoupolis it was with an uneasy mix of befuddlement. 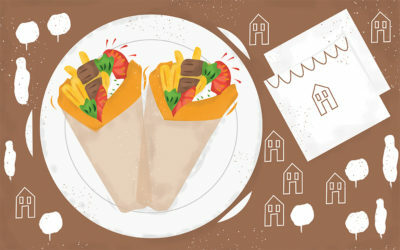 Instead of snow white Mykonian-esque sugar cubes, what filled my line of vision was two rather severe hilltops, each with antique houses piled on high amphitheatrically and also sternly, as if issuing a silent dare to the tsunami from the next Thera eruption: Go ahead, mess with us. Try it. And oh, don’t attempt some facile writerly analysis either…but do throw a rose in our direction, we won’t sniff at that! 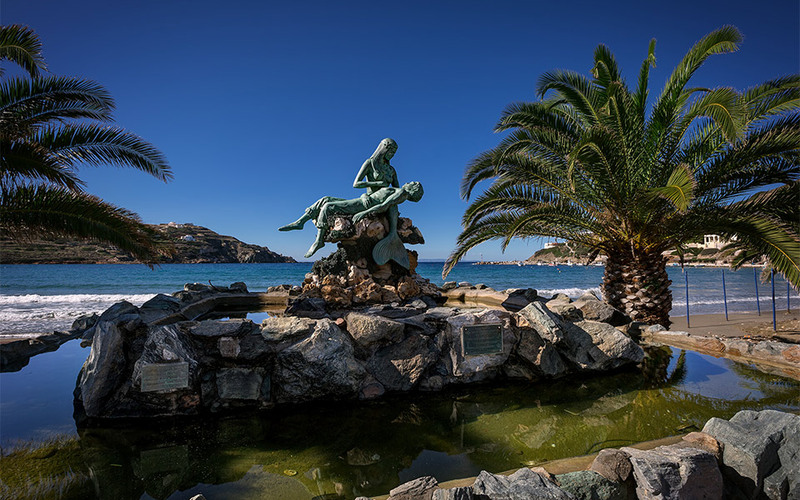 Here’s some Baedeker Lite: Syros is the administrative capital of the Cycladic Islands but its chief city, Ermoupolis, looks nothing like the chief towns you’ll find on islands elsewhere in the archipelago. 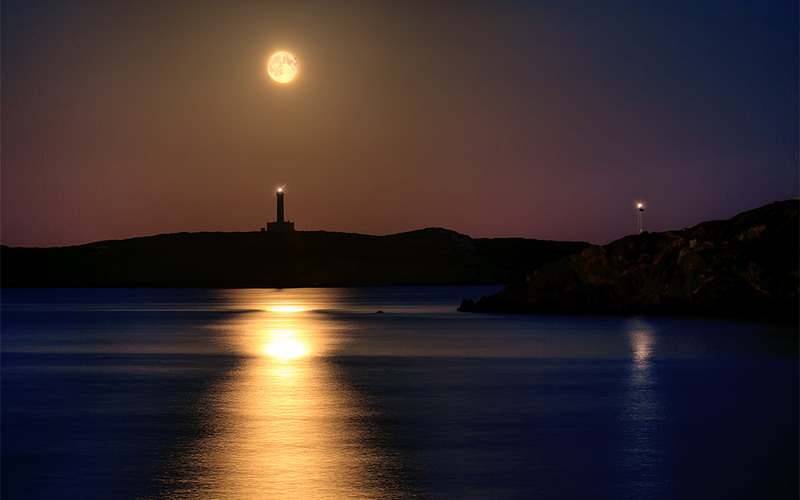 Mykonos may be just 20 miles from here, but aesthetically speaking it’s light years away. This is principally because the Ermoupolis you see today was constructed in the 1820s, during the time of the Greek War of Independence. And it prospered, bigtime; in fact it would be a long while before Piraeus eclipsed its commercial heft. But don’t be fooled: this is Greece, and the history goes back just a bit farther than that. There was an early Bronze Age settlement and lots of incursions from various corners of the Mediterranean after that, but from 1204 to the day in 1522 when Barbarossa moved in, the Venetians held sway. 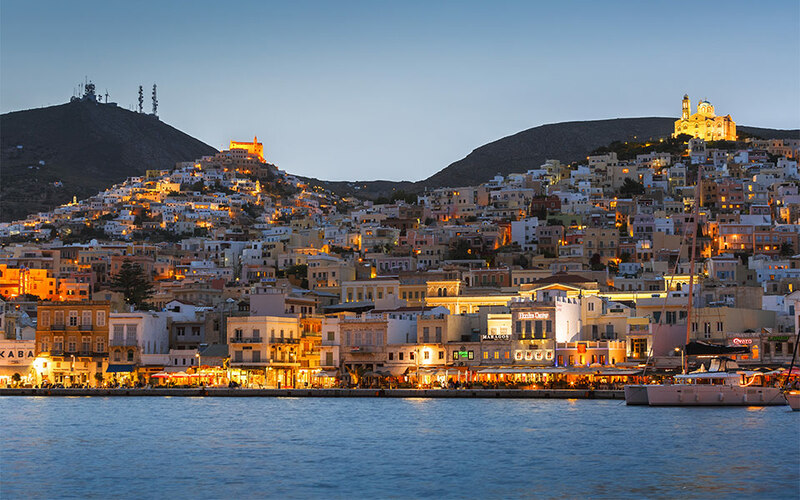 So it is that one of those two hills you see soaring over the port is the older Ano Syros, largely medieval in aspect, and crowned with the 13th century Catholic cathedral of St. George. 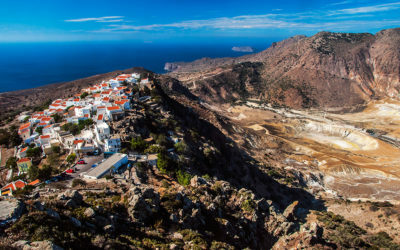 The hilltop that is not Ano Syros? Crowned with a church that is Greek Orthodox. Ever noticed that the more commercial hustle bustle a place has, the fewer the churches? It certainly occurs to one in teeming Ermoupolis. Yes, there are prominent ones, like the blue-domed St. Nicholas and the Assumption of the Virgin, which has an icon by El Greco. But head into the Syros back country and you don’t see churches everywhere the way you do in say, Tinos or Ios. That said, I made my way to the wide beach at Galissas and way up high over it, like a reluctant lifeguard lording it over the bay below, there was a tiny white chapel: Had Jesus been present in the flesh I might have asked him for a glass of ouzo the better to savor all this sky and light but I had to accept that perhaps I’ve been reading too much Kazantzakis on the Internet (it can happen), and also that this was (sin alert?) not actually a bar. Down in the shallow blue-green water of Galissas Beach, I tried to relax but a woman was screaming at her husband for tossing their dog into the water without her permission (though the dog was wearing a life jacket so neither I nor all the people witnessing this scene could really see what the fuss was). Seeking calm I swam out to the edge of the shallows and looked out to the sea. A school of flying fish zipped past me, about 200 meters from where I swam. In a few seconds, more fish flew by. Back in town, I was struck by a long wall of quite vibrant street art, the likes of which I’m accustomed to seeing in Athens. Among the mix was a somewhat terrifying depiction of a long-haired pink zombie skeleton riding a fish. I walked into the lobby of the Hermes Hotel looking for a friend I had a feeling I would never meet again. I was okay with this, more or less because it’s the kind of thing that happens when you travel a lot, and islands are by definition not places that trade in permanence. So I was expecting to find a hotel lobby and I did, but what I also found was a time warp. Science shows that not even Cher can turn back time, but this hotel sure does. I asked and sure enough, the place dated from 1963: old bones for a modern hotel. There was a beautiful woman at the front desk and I asked her if I might have a look around and she agreed, handing me the key to a room. I walked down a long corridor, past a model ship and to a first-floor room that was nice and no frills. Over the bed there was one of those built-in radios that you used to see in hotel rooms in the 1970s, and in a heartbeat I was transported to hotel somewhere in Rhodes, circa 1973, and I realized man, I am getting old, and I also (gulp) realized that I might be falling in love. A bit shaken, I exited the room, closing the door softly behind me. Sinuous Protopapadaki Street unfolds in a long graceful curve just a a whisker away from the busy seafront. It’s not paved with asphalt. Unless I am mistaken, it is paved with…marble. And is unmistakably gorgeous. Passing by at night, I saw a photographer setting up for a shoot—and why shouldn’t he be? This is a Cycladic island red carpet, hammered out in dazzling white, and all who tread here are the stars of the show. What could you say to that? The malaise was so supreme, so perfect, it felt for a moment like making love. With whom I cannot say and probably no one but oh, when the moon does look down upon savvy Ermoupolis, keep an eye on your heart folks. 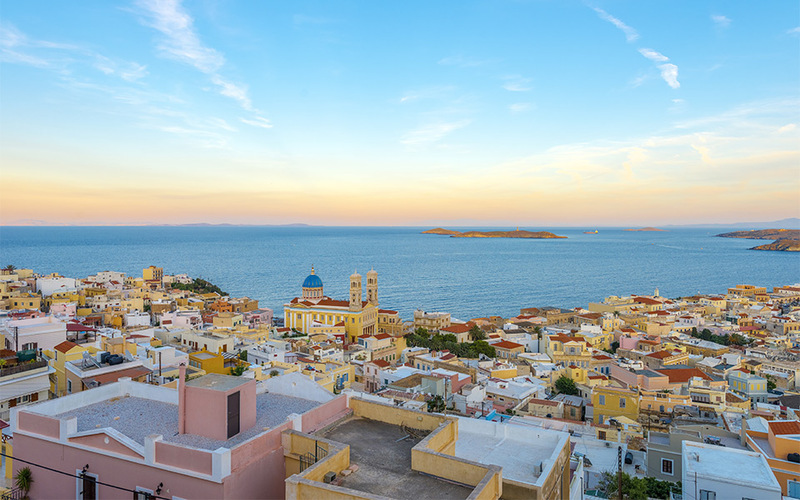 Ermoupolis is the capital of the Region of the South Aegean and the largest town on the island of Syros. It is reachable by ferry from Piraeus in about three hours and 25 minutes. The most frequent service is with Hellenic Seaways and Blue Star Ferries. 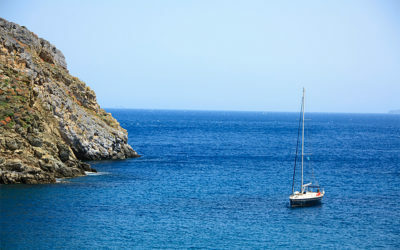 The Hotel Diogenis has the advantage of being right next to the port, though is not big on charm. Hotel Ethrion (ethrion.gr) is a nice spot in a calm location just behind the port; ask for a room with a sea view balcony. Hotel Ploes is fashionable and artsy, but also pricey. Its café overlooking the sea is worth a stop. If you want to overnight by Galissas beach, try the family-owned Hotel Remvi (hotelremvi.gr). Back in town, Avant Garden (avantgarden.gr) serves creative Aegean cooking in an urbane garden setting, while the beautiful Mazi (mazi-syros.com) also wins plaudits for its “inspired Greek cuisine.” And Amvix, right by the port at 26 Akit Ethnikis Antistaseos, is the best Italian restaurant in Syros—and maybe in the entire Aegean.